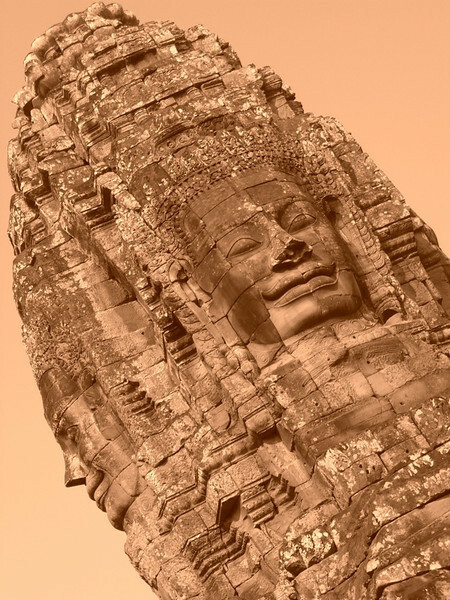 One of the almost 200 faces in Bayon smiles in the fading sun. Read about our first impressions at the Temples of Angkor. There was an active Buddhist temple on the northern side of Bayon. These wait to speak with the monk, likely for a blessing. Read about our first impressions at the Temples of Angkor. Mobile phones are everywhere and penetration is ever-increasing. 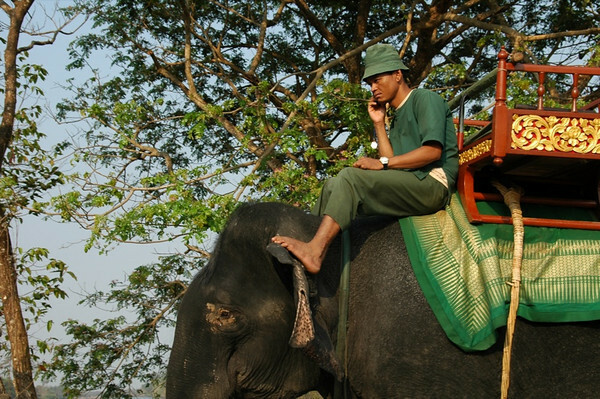 Here, a mahout takes a phone call while on duty at Angkor Wat. Read about our first impressions at the Temples of Angkor. An attendant at Bayon temple takes a break from the crowds at the northern side of the temple complex. Read about our first impressions at the Temples of Angkor. 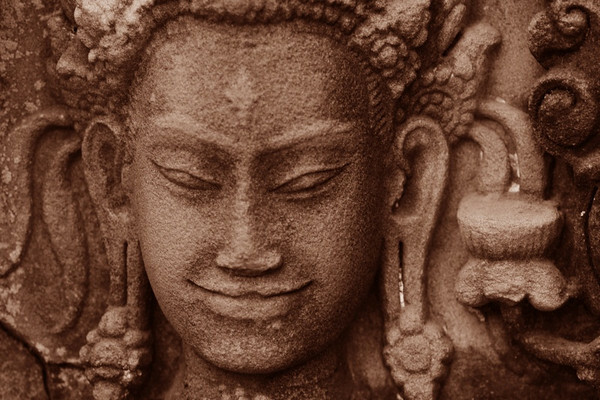 One of the many beautiful faces carved into the stone at Bayon. Read about our first impressions at the Temples of Angkor. Part of the Angkor Thom complex, Bayon was built around 1200. Its most striking feature - smiling stone countenance looking down at you wherever you turn. Some experts believe this face is the face of King Jayavarman VII, the omnipresent king watching over his people. Read about our first impressions at the Temples of Angkor. Like much of the tourist hordes at Angkor Wat, this tourist climbs up to enable a good shot of herself atop the Terrace of the Elephants near Bayon. Unfortunately, the regulations are not strict about what tourists can and cannot do. Angkor Wat is full of tourists at all times, but especially so around Chinese New Year. Read about our first impressions at the Temples of Angkor. 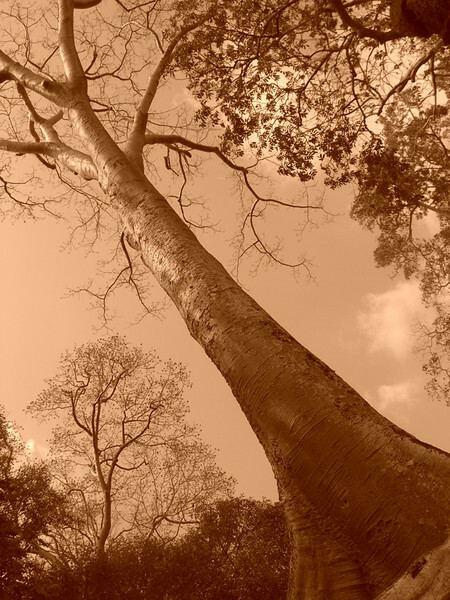 A tree stands tall over Ta Prohm temple. Read about our first impressions at the Temples of Angkor. A monk looks out over Bayon temple ruins from a smaller active temple across the road. Read about our first impressions at the Temples of Angkor. Ta Prohm temple has intentionally been left in the same state it was found by French archeologists 1860, thereby allowing nature to continue to take its course and have its charming and mysterious way with the temple. 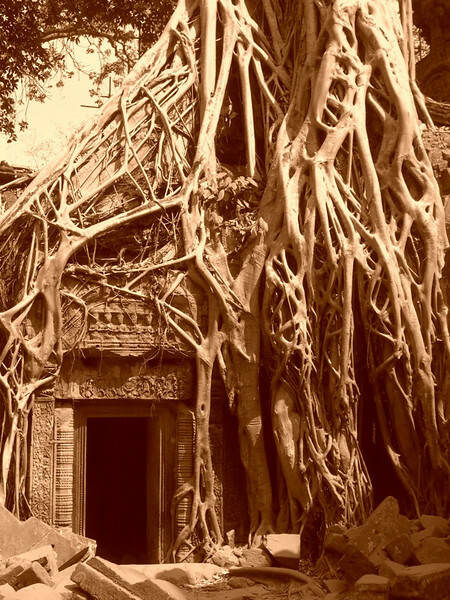 The trees grow on top of stones and their roots wind around and through the temple buildings, lending it an otherworldly feel. Ta Prohm's modern claim to fame is its role in the film Tomb Raider. 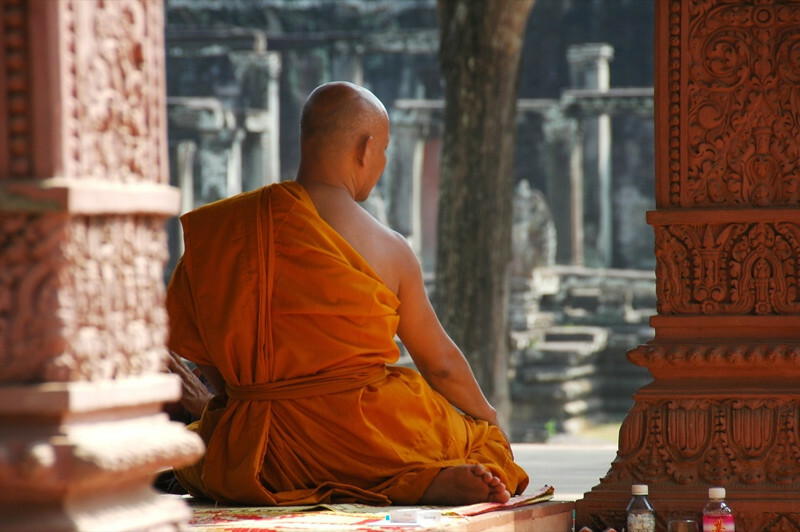 Read about our first impressions at the Temples of Angkor. 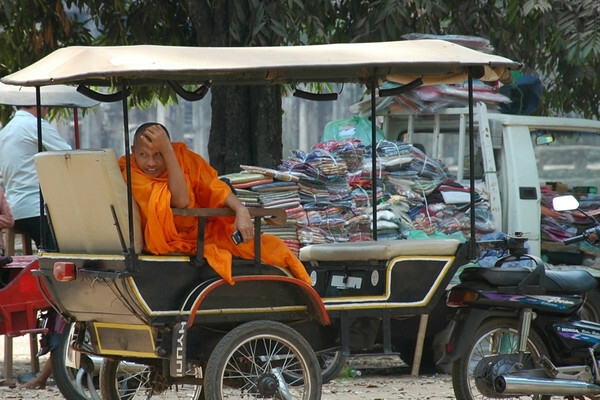 A monk hangs out in a tuk-tuk, waiting for his driver to return from lunch. Read about our first impressions at the Temples of Angkor. 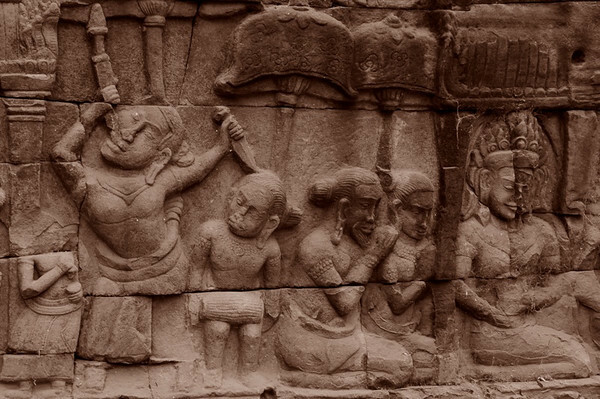 Reliefs at the Terrace of the Leper King depict hunting scenes, slaves, dancers, animals and other images from life in Angkor Wat during the 13th century. 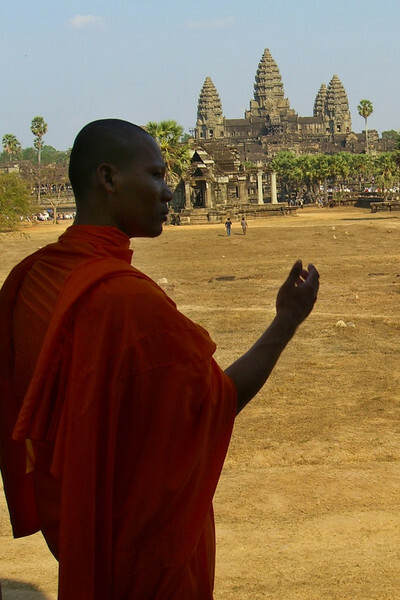 Read about our first impressions at the Temples of Angkor. Seeing (and avoiding) the hoards of tourists entering Angkor Wat on the central walkway, we took shelter in the arcades of the outer wall and admired the temples in relative peace. This Buddhist monk had the same idea. Read about our first impressions at the Temples of Angkor. The steeper the climb, the greater the views of the terraces landscape surrounding Angkor Wat. Note: the treacherous steps at the side entrance to Angkor Wat are much easier to walk up than to walk down. Isn't this always the case? In either direction, tread carefully. Read about our first impressions at the Temples of Angkor. 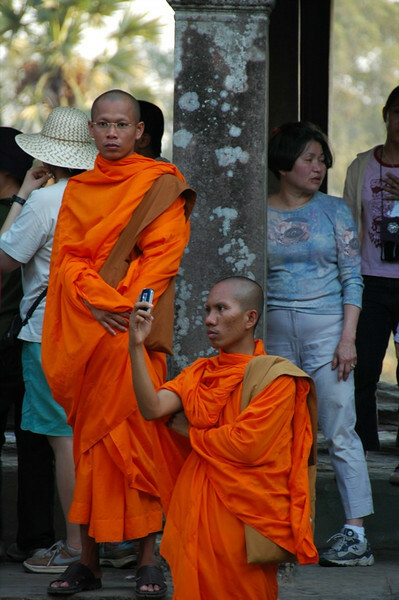 This monk takes photos of Angkor Wat with his mobile phone. As we waited for the sun to set, we watched the line of people behind grow longer and longer, but not really move. We finally realized that this was the line to go down the one set of steep steps that had a handrail. Being impatient, we risked our life on a different set of stairs. The guards below assured us we'd be OK, but halfway down the vertical stairs we weren't quite sure. Read about our first impressions at the Temples of Angkor. 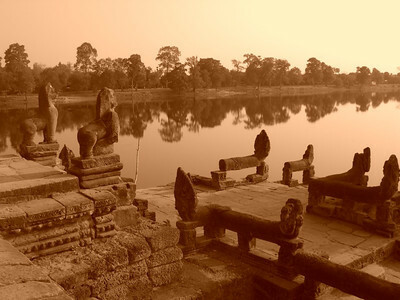 Most visitors make their way to the inner temples of Angkor Wat along the central walkway. We decided to follow the road less traveled with these monks and enter from the side. 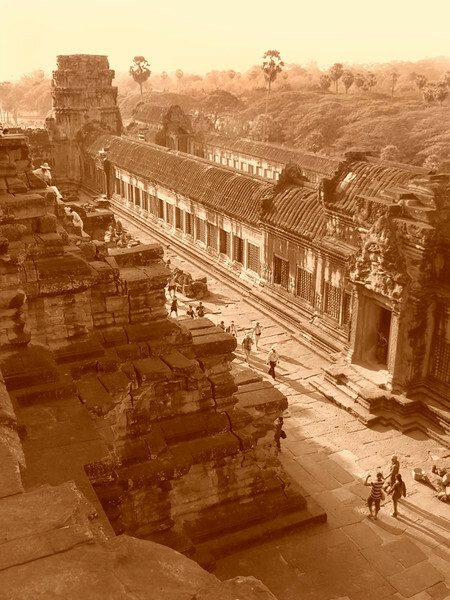 Built in the 12th century, Angkor Wat is now competing to be one of the seven wonders of the modern world. 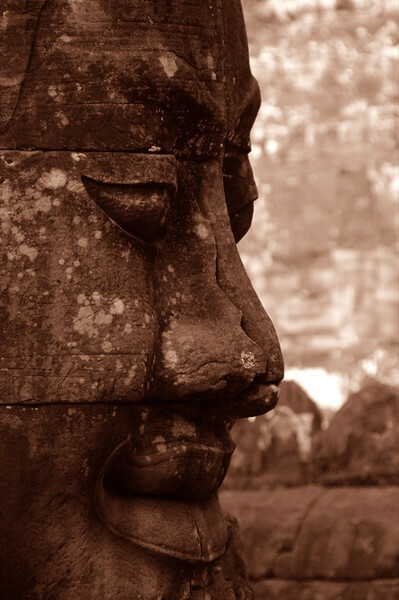 Read about our first impressions at the Temples of Angkor. We noticed several men walking around with large cameras and vests marked "Official Photographer". Given that every tourist around seem to have *at least* one camera, we couldn't see a need for them. 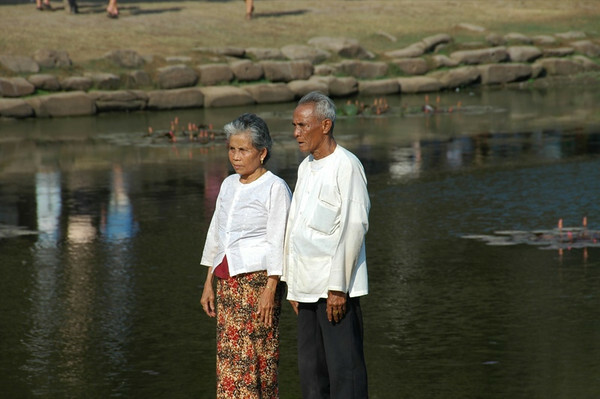 This elderly couple, standing tall and straight for an Official Photographer, clued us in to the Cambodian penchant for professional family portrait shots at the Angkor temples. Read about our first impressions at the Temples of Angkor. Read about our first impressions at the Temples of Angkor. Anyone who has visited the temples at Angkor recently has seen many girls like this one. She's counting to ten since she sells 10 postcards for $1. Besides being coy and playing the guilt card, these girls are sharp. Dan tested one postcard girl after she finished counting to 10 in English, German, French, Spanish and Italian. When he started counting in Estonian, she continued in Finnish. When he counted in Czech, she finished in Russian. Pretty smart kid. 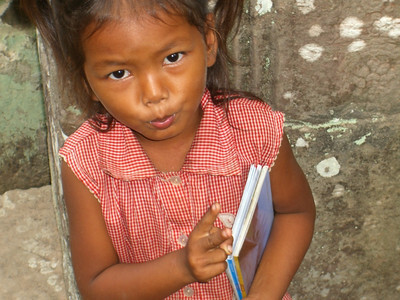 Read more about the kids of Angkor. 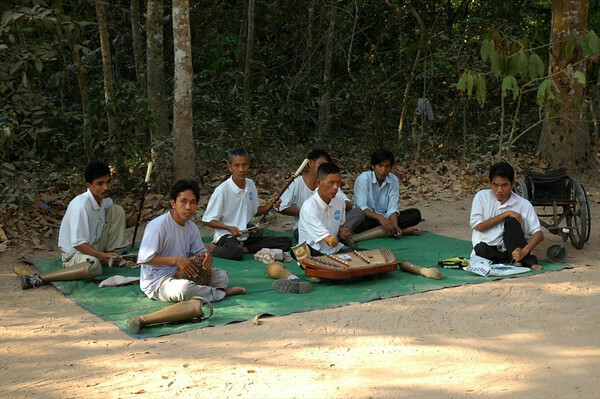 A musical group made up of land mine victims plays traditional Cambodian music along the path to Banteay Kdei temple. The music was quite good and it was impressive to see the guy play the dulcimer type instrument without a full hand. Read about our first impressions at the Temples of Angkor.